DESCRIPTION: This exciting program brings you to the heart of conflict in the South Caucasus. Participants will meet a variety of local specialists, including academics and practitioners who will provide an inside view of each side of the conflict. Students will spend time in Tbilisi and, if possible, Sukhum/Sukhumi. Formal class sessions are complemented by various site visits to encourage a more comprehensive understanding of the multifaceted issues affecting societies in conflict. The program aims to provide context for understanding the changes that the South Caucasus region has experienced during the last 25 years, opportunities for understanding conflict tensions surrounding inter-community relations, and the aftermath of wars involving South Ossetians, Abkhaz, Russians, and Georgians, as well as the conflict over Karabakh. Related dynamics in the North Caucasus and globally will also be considered. INSTRUCTOR: Dr. Susan Allen will lead this program. Dr. Allen is a scholar-practitioner of conflict resolution whose main focus is on the South Caucasus. She also works on evaluating conflict resolution initiatives and community conflict resolution approaches. She has engaged long-term in conflict resolution in Eurasia, as well as contributing to a variety of initiatives in other regions. Program fee includes double-occupancy hotel lodging; daily breakfast; most other meals; in-country ground transportation; airport transfer; emergency evacuation insurance; pre-departure orientation; cultural excursions; course trainers and speakers costs; Tuition for 3 Credits (CONF 399*/695); but NOT international airfare. Classes will be held in the region June 2 through June 8. 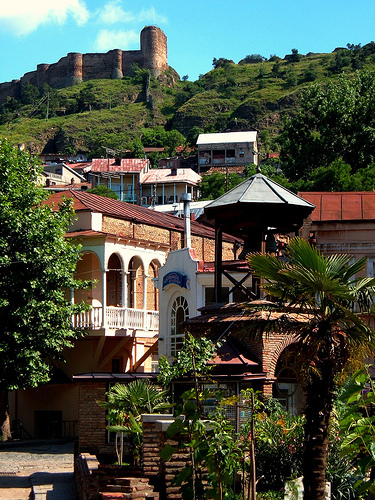 Students must arrive in Tbilisi, Georgia for class starting at 11 am June 2. Students will be free to depart after 6 pm June 8. ELIGIBILITY: Conflict Resolution in the South Caucasus is open to all Mason and Non-Mason bachelors, Ms and Ph.D students as a 3 credit course and to non-students as a professional development seminar. Mason students can take the course as CONF 385*/399*/695 (Other options may be available – check with your advisor). IMPORTANT NOTICE: Master Students graduating in the Spring 0f 2012 are still eligible to walk during the May Graduation Ceremony while enrolled in this class.